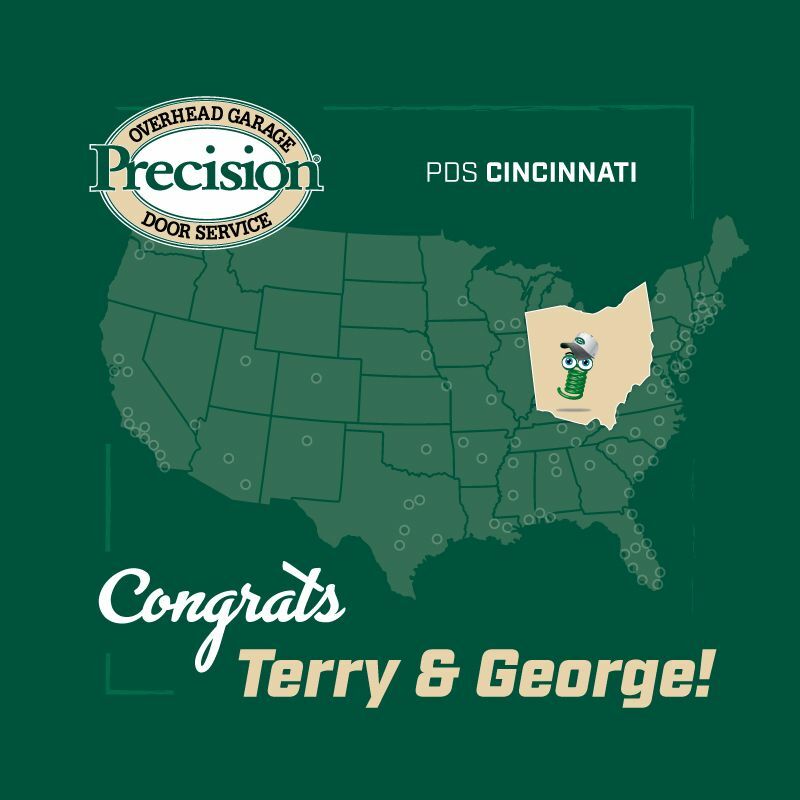 CINCINNATI - May 10, 2018 - PRLog -- Precision Door Service of Cincinnati is pleased to announce the company's new owners, Terry White and George Shaw. Bringing their experience and high standard of excellence to the business, Terry and George are excited to be at the helm of Precision Door Service of Cincinnati. They will continue to bring Precision's outstanding service and premium products to the consumers in Cincinnati. Precision Door Service of Cincinnati is a full service garage door company specializing in garage door repair, new garage door installment, and repair of garage door openers. This location proudly serves customers in the following counties: Brown, Clermont, Hamilton OH, Boone, Bracken, Campbell, Gallatin, Grant, Kenton, Pendleton KY, and Dearborn, Ohio IN. Terry White has 23 years of experience in the garage door industry. With Amarr/Entrematic, Terry held many different roles within the company. General Manager, District Operations Manager, District Sales Manager, Director of Builder Accounts, and Director of National Accounts are some of the roles he held with Amarr/Entrematic. Terry headed up the Precision national program where he played a key role in the development of the private label door and opener program that Precision Door Service is currently using. He believes in Precision so much that he left the manufacturing/distribution side and joined PDS as an owner. George Shaw has worked for Precision Door Service since 2002. Over the years he obtained various garage door licenses, certifications, and awards. George managed a top ten Precision market for several years. In 2014 he joined the Corporate office as National Director of Field Operations where among other responsibilities he provided on site support for markets, re-wrote the technical training manual, and held quarterly training classes to bring new hires up to speed on the technical aspects of the job. George had aspirations of franchise ownership for quite some time. With 90 locations servicing more than 1000 doors per day, Precision Door Service is the nation's leading garage door repair company. Precision Door Service provides consumers the highest levels of customer service and value for all garage door needs. When a customer calls Precision Door Service, the call will be answered by a live operator and an appointment will be scheduled at a time that is convenient for the customer. At Precision Door Service, we appreciate your business and are willing to work hard to keep it. "We Fix Garage Doors Right."